Hamaguchi sensei I believe? I briefly met Katsuya and some of the other Brits prior to keiko. None of them (save Katsuya I guess?) brought their kit. Excellent website, thank you for sharing your valuable experiences and thoughts. Will be coming back often. May I ask the origin of the diagram 46 displayed here? I would like to see more of where that came from! Thank you. Juandiego- Thank you for your kind words and interest in my blog. Illustration 46 was given to me as part of a set of lecture notes compiled by a Mr Sakigami of Nishinomiya, Hyogo-ken, following a series of lectures by the late Matsumoto Toshio Hanshi kyudan. The lectures were given to members of a private kendo study club in Nishinomiya formed to benefit from Matsumoto sensei’s teaching in his latter years. I was fortunate enough to have been a member of this group. 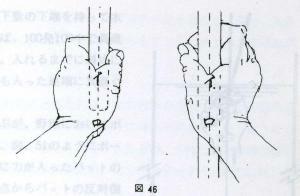 To the best of my knowledge, the illustration was in the possession of Matsumoto Hanshi and is a drawing of Mochida Seiji sensei’s hands. Thank you for your response. I see, I was hoping that it would be found in a publication. I wish I had seen this diagram years ago! Particularly, I had been struggling much to get the right hand in the correct position. I am glad that what I have come up with with the advice of my teachers resembles this diagram. Please keep up the great blog! As a beginner I am trying hard to get the concept of tenouchi, finding it difficult to break it down into the correct timing, I recently saw a video of a Sensei bouncing a ball with a bokken explaining that without proper tenouchi you cannot keep the ball under control. I guess this wouldn’t help in an upright position but may be useful to demonstrate the feeling at point of impact and the relaxed hands prior to impact? The closest action I can think of is the way a drummer uses a stick on a snare drum perhaps …but then again maybe I’m over thinking it all and as a consequence increasing the tension in my whole movement. It’s not easy this Kendo business! Another method that is sometimes practised to learn tenouchi is to cut through a taught newspaper with a shinai. If it goes through in a perfectly straight line, you are doing it correctly. On a more practical level lots of suburi should help get it right.